In my previous post, I explained about pick activity and also explained where we can use this activity in BPEL. Below are the two scenarios where we can use pick activity. In This post, I will discuss about first scenario and show one use case of that. In this scenario, we call one asynchronous service which provides response in certain time frame, if that service is not able to provide the response in that time period then we need to throw time out error and stop the processing. 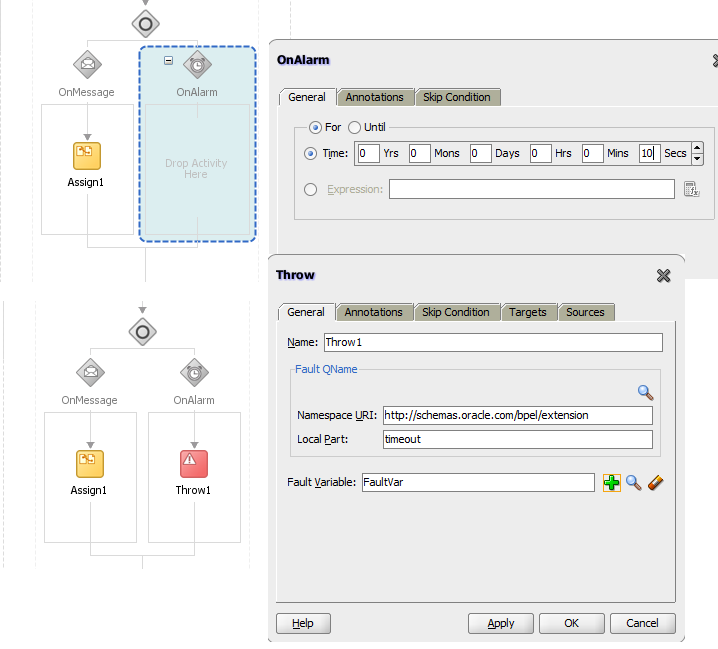 First create an asynchronous service and deploy it to SOA server. Now create a new composite and add BPEL component to it. From this composite, we call asynchronous service so we need to add asynchronous service reference in the composite, once asynchronous service reference is added, wire it to BPEL. 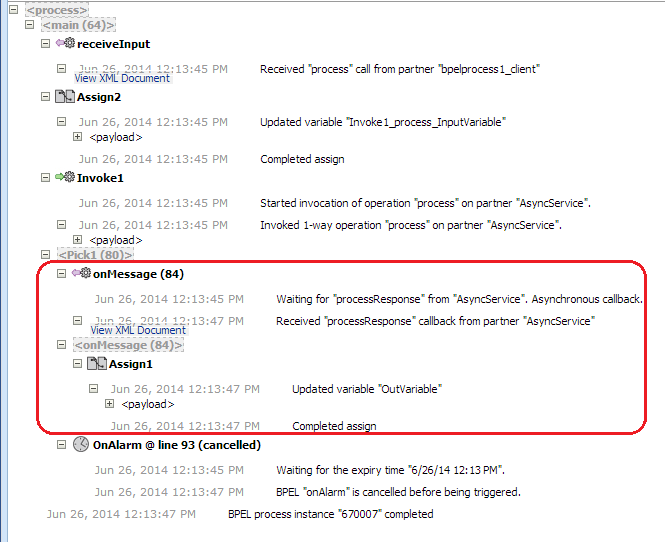 Now open your BPEL process and add “Invoke” activity inside it to call asynchronous service. 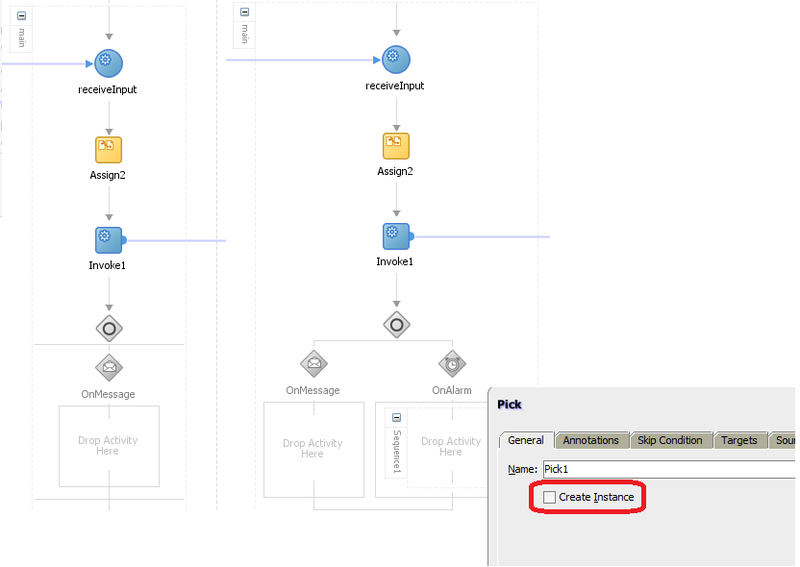 Add a pick activity after the Invoke; this pick activity has two branches. First branch is “OnMessage” and other is “OnAlarm”. Click on Pick activity and add “OnAlarm” branch also. Make sure that “Create Instance” box in unchecked for pick activity as we don’t want to create any instance, we just want to get the response back from asynchronous service. Let’s first talk about OnMessage branch, this branch is used to get the response from asynchronous service. This branch act like a receive activity. 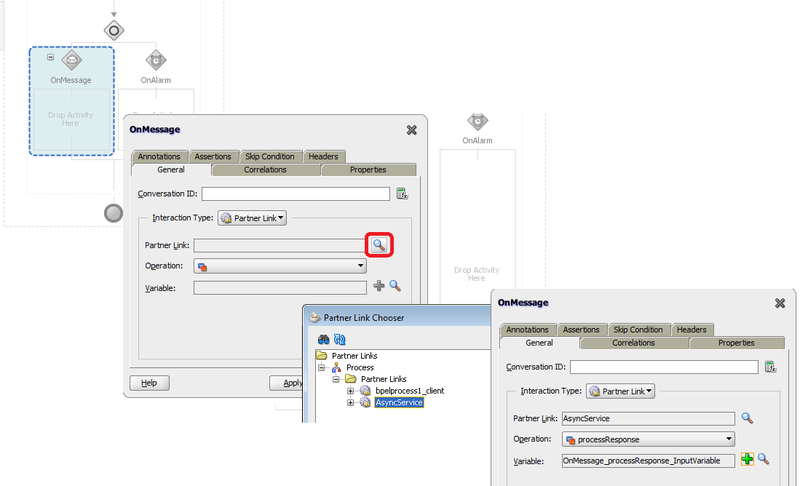 Click on OnMessage branch and choose the reference service partner link. 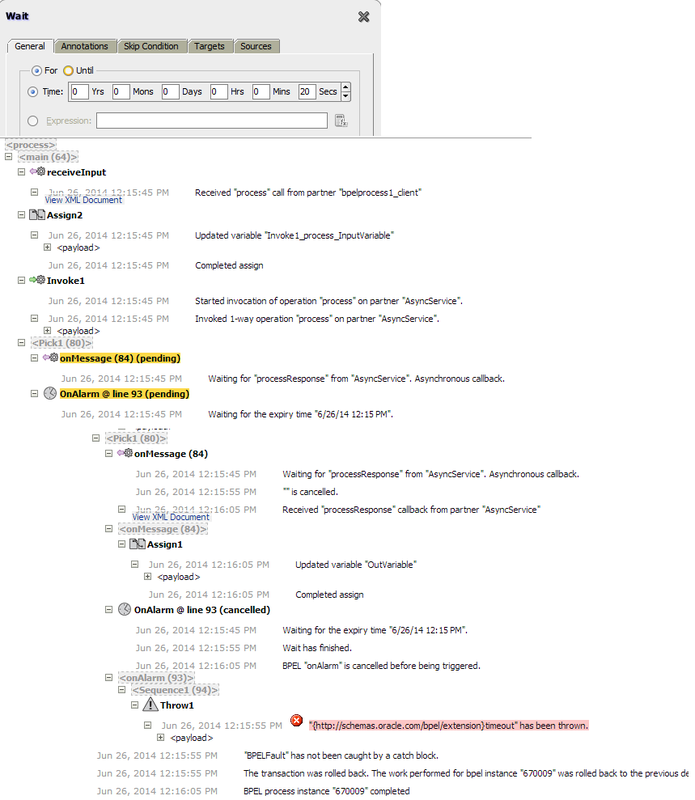 In OnAlarm branch, we specify the expiration time which means if we get the response from asynchronous service within specified time then control will go to OnMessage branch and we successfully retrieve the message and if asynchronous response time exceeds specified time than control will go to OnAlram and whatever activities we have added there will execute. 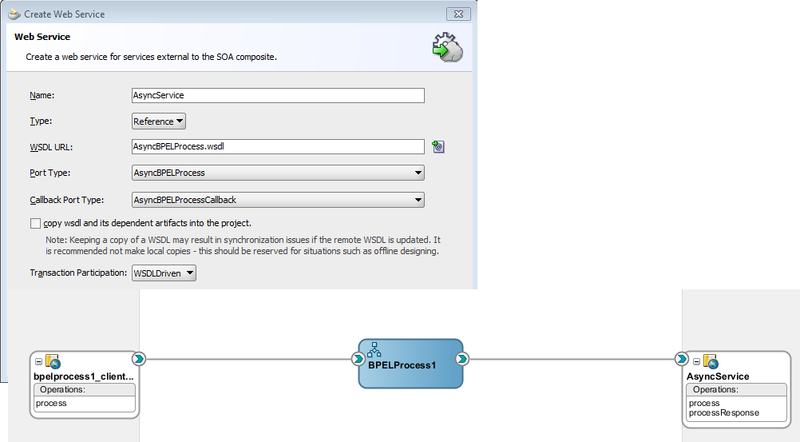 Below is the final flow of the BPEL. Now deploy this composite and we test both OnMessage and OnAlarm branch. Let’s first test OnMessage branch, as shown in below screen shot, asynchronous service provided the response within specified time limit so control goes to OnMessage branch. Now let’s test OnAlarm branch. For this we have added some wait inside asynchronous service so that when first composite call asynchronous service, asynchronous takes more than specifies time.